It’s fairly normal for an artist to release a new album containing somewhat of a different sound to previous releases. Stylistic new directions are somewhat of a given these days. But Brutal Romantic, the fourth album from New Zealand songstress Brooke Fraser, may be of a surprise to loyal fans. It’s an extreme departure from Fraser’s well-known softer, folk stylings and takes the listener on a journey into a brave, experimental new sound. Brutal Romantic is short – only thirty-seven minutes in length – but the places and soundscapes that this album goes in that time are really interesting. It’s a very textured record, and there are quick leaps from chilling, icy sounds to warm, disco tracks. No two songs on this record are like each other, and for an established alt-pop artist like Fraser this is very daring. I wouldn’t be surprised if much of the glitchy and experimental vibes on this album were influenced by fellow Kiwi Lorde. The first single Psychosocial opens the album: a song which announced Fraser’s new direction with much shock. It’s an intense, haunting number with a wailing choir on the hook and stacks of cool. I’m not sure what the message of the song is but it appears to be about a love-hate relationship with social media. Thunder is filled with electronic influences and layered harmonies. The groove on that track is infectious. Start a War is poppy but restrained, and showcases Fraser’s sweet vocals. Radio single Kings & Queens is a glittery disco delight, complete with slinky bass. No doubt it will hit mainstream radio this summer. Christmassy brass open the title track. It’s a ballad and serves as a breath of fresh air amongst the intensity of the varied sounds on the album. Je Suis Pret (French for ‘I Am Ready’) is a haunting slow jam with strong images of rebirth and baptism. The lyrics shift from being individual to corporate (‘we are ready’). Some raucous distorted guitars round off this track with a punch. Magical Machine is filled with beeps and boops and a near-reggae feel. Fraser name checks a number of machines, including ATMs. New Histories is atmospheric and textured with a touch of 80s sustained synths. The record closes with New Year’s Eve where Fraser reflects and sings about ‘finding something true’. I’ve got to admit, I was quite impressed by this album. This is an unconventional record, and not just for Fraser. That this is released on a commercial label (Sony) surprises me, as I would expect there to be pressure to make a familiar album that fans will lap up, especially this close to Christmas – there is no Something in the Water here. But Fraser’s gamble has paid off. This is a layered, mature album that music-lovers will adore. Fraser will surely win a score of new fans in the process. Although references to her faith aren’t as clear on this album, there’s some strong themes and statements running throughout. I’m giving Brutal Romantic four stars. 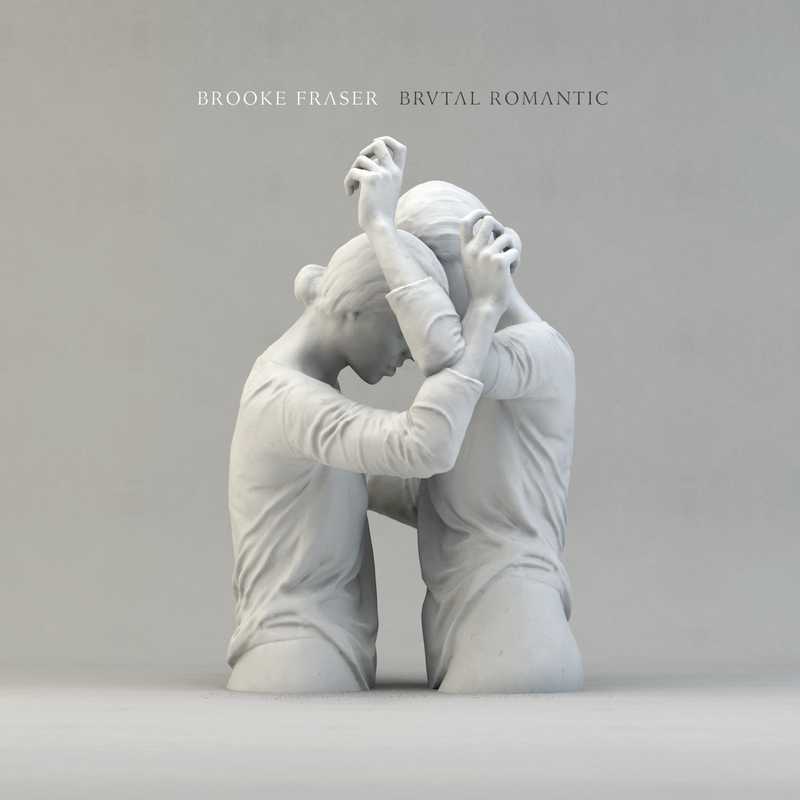 Brutal Romantic by Brooke Fraser will be released this Tuesday, 18th November in the US, and can be pre-ordered on iTunes. It is available now in Australia and New Zealand. Posted in MusicTagged Album Review, Brooke Fraser, Brutal Romantic, christianBookmark the permalink.